We had one of the sleds in the shop earlier this week and decided to ride up to Bergland and pick it up. We took trail 1 north to the Fisherman and had an excellent walleye breakfast. While eating breakfast the snow really started to come down and the visibility on Lake Gogebic was very reduced. We decided to go for a short ride up to Rogers bar and back. The people there are wonderful and I’d suggest stopping in if you are in the Watersmeet MI area (home of the world famous Nimrods!). We took trail 1 north and hooked up with trail 2 (the rail bed). We ran trail 2 down to the turn for Rogers bar and got off there. I was a quick ride and the rail bed was in great shape! There were a few rocks here and there, but that is expected. After we left Rogers we headed back west on trail 2 and hooked up with trail 11 south. We rode this trail a few days ago and were the first sleds on it in quite a while. This time it was a bit different because parts of it had been groomed and a lot of the brush was cleared. Once we got into Wisconsin we hooked up with trail 6 east and headed home. 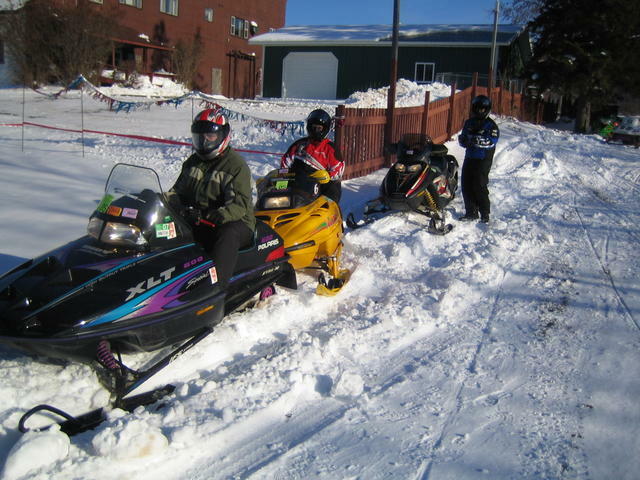 We decided to take it easy today so we rode in to town to support our local snowmobile club. They had a breakfast fund raiser at the Presque Isle Pub. The food was great and so were the club members! We took a ride up to Gogebic Lodge tonight. When we left Winchester the trails were a little bare, but not too bad. As we headed north on trail 1 the snow depth seemed to pick up and smoothed out. A few areas were a little rough and wet, but that’s expected for early season riding. Just north of Marinesco we crossed paths with the groomer and after that it was smooth sailing! After a short stop at the lodge we headed back home. On the way home about 90% of the trail was double groomed. It was some great riding! Don’t sit home this weekend and miss out on the great riding! We went for an easy ride today. Through Presque Isle, WI then up to Marinesco, MI on our way to Wakefield, MI. Most places were closed for the holiday, but we were able to get gas at Bingos in Wakefield. On our way back we went down trail 11 to Winchester, WI and had a great time. We were told none of the trails were groomed yet, but they were still in awesome shape! We saw about 10 sleds all day long. On trail 11 we were the first sleds down it and had to make our own way for most of it. There were a few down trees and a pretty big culvert that we had to go around. Other than that, it was an awesome day! If you are thinking about coming up for the holiday week, don’t miss out on this great riding! We left the Porcupine Lodge in White Pine around 10am and hit trail 1 south to trail 12 East. Trail 1 was in decent shape with a few bare spots. This morning it really warmed up a lot and the trails started to show the effects of the heat. Trail 12 was in decent shape for early season riding, but did have the expected wet spots. We joined up with trail 101 south and ran that into trail 13. 101 was in excellent shape and was very smooth and had plenty of snow. Trail 13 was in decent shape, but had it’s occasional pot hole here and there. 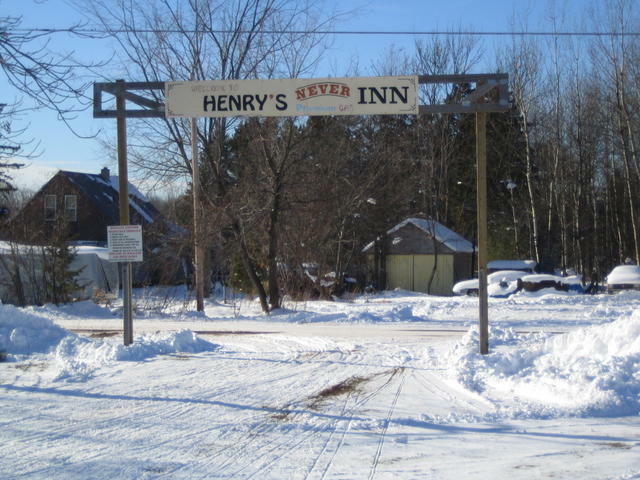 We made it into Rockland around 11am and grabbed some lunch at Henrys Never “Inn”. If you ever visit Henrys and you like mushroom burgers, you gotta try the half – a – heifer! After lunch we took trail 3 south towards Bruce Crossing. This trail was in pretty bad shape and it could really use another foot of snow. There were the typical water holes, and there were also some down trees across the trail. If you decide to ride this trail, just make sure you use a lot of caution and take your time. One of our new riders fell off in a tricky section. Once we made our way to trail 8 and headed East to Bruce Crossing, it was smooth sailing. The railroad grade was flat and smooth. The only bad thing about trail 8 was the heat and sun took it’s tole. It was about 20-30% bare in any spot that had direct sunlight. Other than that it was a great ride! After getting gas in Bruce Crossing we made our way West on trail 8 to Bergland where we hooked up with trail 1 to White Pine and then called it a day. We’ve had this trip planned for quite a while now. My Uncle and Cousin made the trip in from Cleveland, Ohio. We drove up on Friday morning, got everything unloaded and hit the trail by 1pm. Neither of them had ever been this far north, so we wanted to show them lake Superior for the first time. 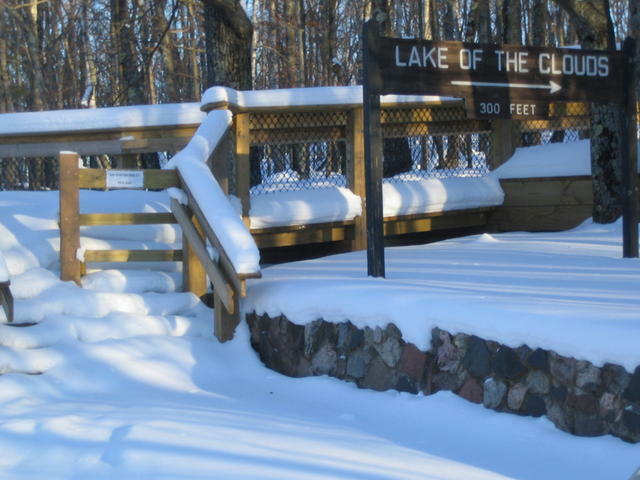 We headed north on trail 1 to Silver City and after a quick stop at the foot hills, we headed West to Lake of the Clouds. It looked like we were the first sleds up the road in at least a few days. We saw several deer on the way up the road and at least two jumped out in front of us (make sure you keep an eye out for them). Once reaching the top we all hiked up the fresh snow to the overlook. I would estimate the snow up top to be around 18 inches. It was super clear and you could see the copper peak ski jump. We took a few pictures and then headed back down the hill. Next we headed south on trail 11 towards trail 102. 11 was in great shape and there was lots of fresh powder to play around in. We made it to 102 and headed south to Bergland. 102 was in good shape for early season riding, but it could use a little more snow to fill in some of the pot holes. Then we hooked up with trail 8 East and made our way to Bergland. We ate a p Antonios and got Nordines. It was time to hit the trails again and we took trail 1 north to White Pine. Normally trail 1 is one of my favorites to ride because it is a wide, straight, hilly road that normally has a TON of snow on it. This year, it looks like they are logging an area that is just off the trail, so they have plowed the road down almost to the pavement. Hopefully they will be done logging soon and it will be back to normal! 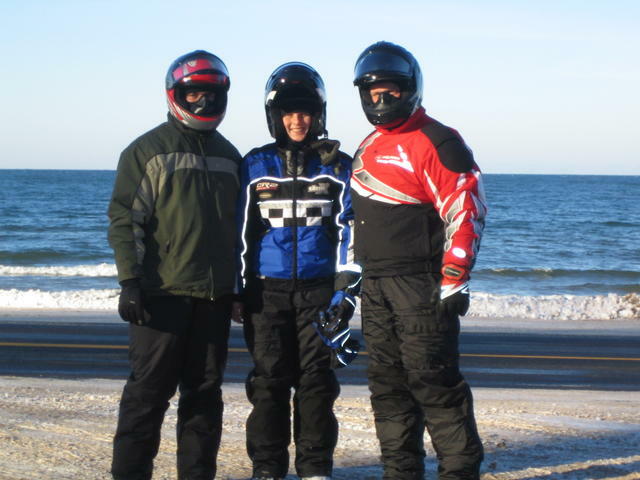 You are currently browsing the Snowmobile Trail Conditions blog archives for December, 2006.